Trendy Ideas to Adorn Your Short Nails in Unique Ways! Majority of young ladies, today prefer sporting artfully manicured nails with intrinsic art design on top of the nail. If you have not tried the magic of nail art, then let us tell you that you are missing a spectacular beauty trend. Nail art has been here for quite some time. Almost all nail art parlous offer nail extensions to create different types of designs. What’s even more exciting about nail art is that your short nails are good enough to go. While women with long nails are at advantage, ladies with short nails can have the fun also. Don’t you worry! Nail art, especially for short nails has become a beauty essential. Before you head out towards the nail art parlor, make sure that your nail is clean and trimmed. There are no cuts and bruises around the nail areas of your fingers. Generally, while doing the art, nail artists use chemical removers to clean any type of dust particle or foreign element for the smoother finish. These chemical removers might feel a bit stingy and painful on bruised or the nail skin with a cut. Hence, better be careful about this! Here are some of the topmost trending short nail art picks for you to try and take pride in. As a child, you loved those colorful and sweet candies. Didn’t you? Candy hues are a perfect inspiration to etch out those childhood memories on your nails! Go for bubble-gum pinks, lime greens, sunny yellows, and juicy oranges and even try the yummy dark chocolate. Combine the hues with the bold color blocking designs to make them look amazing. We have adored some or other cartoon character since we were a child. Minions, Power Puff girls, Mickey Mouse or Batman, we haven’t forgotten them as yet. Time to show the world which cartoon character is your favorite through your nail art. 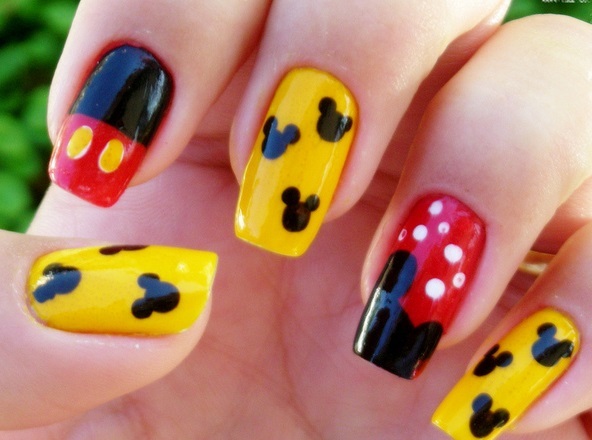 So, go on and select your favorite cartoon character and get it painted on your nail. It will be super fun! Giving seasonal hues to your nails is a great idea too! During the spring season go for the floral designs in bright colors like yellow, red, purple, green etc and add a dash of glitter to make them sparkle even more in the daytime and at night. Do try! For the ones who don’t want to go loud, we suggest you go neutral. Beige, creamy pink, creamy browns, and peaches. Mix up the neutral colors with funky designs in Aztec or animal skin patterns. Add on some glitter and you are ready to conquer the world with artsy short nails. Time to adorn your nails with some classy nail jewelry. Apart from trying to decorate your nails with artsy designs, you have all the right to try the bejeweled look for your short nails. Yes, it’s much possible on short nails too. Get crystals or stones and don them up, especially around the cuticles of the nails. Don’t forget to apply the extra dash of glitters around them. And, you are all set. Which is your pick for the coming season? Share with us in the comment section below.